All the sewing I’ve done before has been household stuff (cushions, peg bags etc) and the couple of forays into clothing have used no-pattern internet tutorials. With the exception of the little girl skirts these items haven’t turned out looking very polished. 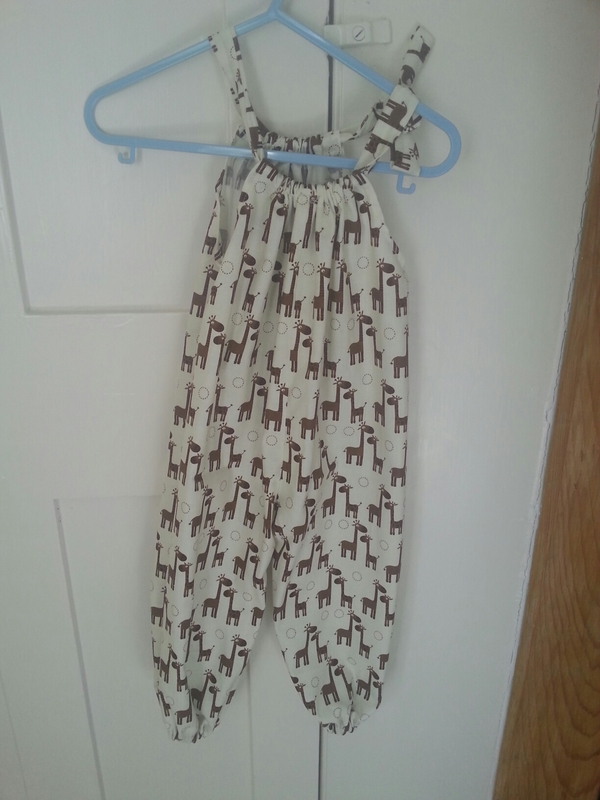 So, as I continue to build up the summer baby wardrobe I thought I’d have a go at a real pattern. I came across Sew Sweet Patterns via Pinterest and they didn’t look too hard and are very reasonably priced plus they are downloadable so I took the plunge. I had some suitable fabric from the stash building sale I went mad in from StitchStashDiva (American site via Etsy but even with postage fabric is still cheaper!) So I demanded a day “off” baby care. NB, for the breastfeeding mum of a ravenous baby this does not allow leaving the house. First up, the Summer romper. It was so easy! The only tricky bit was when making the tie, getting it to turn the right wsy out as it was so thin. It ripped from the pressure of fabric trying to push through the channel, so it’s not as neat as it could be, but probably not very noticeable. I can’t wait to try out more!